Sapa is a well-known destination in Northern Vietnam. The town resides in the highlands at an elevation of approximately 1500 meters and carries moderate and rainy weather in the summer, while being cold and occasionally snowy during the winter. Sapa is the home of many unique ethnic minority groups, therefore, it houses many rare and special cultures that are hard to find elsewhere. Combining with magnificent natural landscapes, Sapa makes a special and exceptional tourist site not only in Vietnam but in Asia in general. Here are 10 things to do in Sapa for first-time visitors. 11. Ride a motorbike around Sapa. 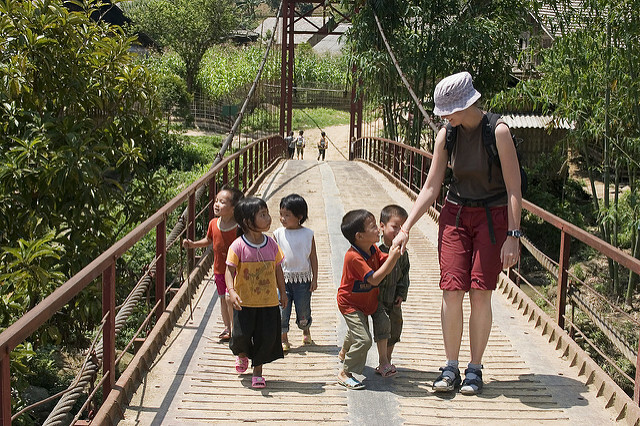 There are plenty villages of minority groups in Sapa, where tourists are now welcome to visit while guided by locals. 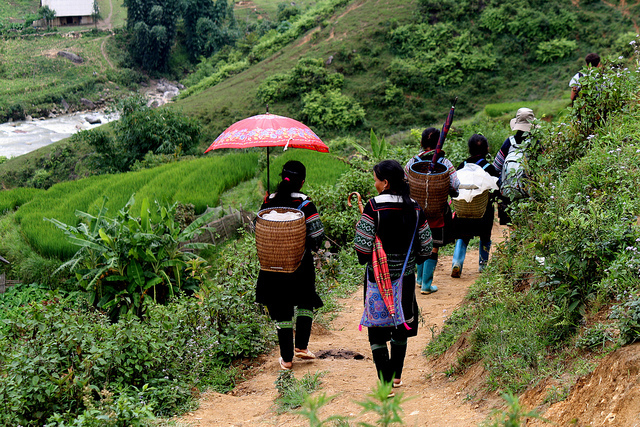 Trekking to these villages or trekking with locals is the most efficient way to explore the life and beauty of Sapa. It should depend on your need to decide where you should head to. If you are a nature lover, then you should visit Lao Chai- Ta Van. Trekking to these 2 villages, tourists can witness the stunning beauty of terraced fields, uncapturable by photos. As these are villages of H’Mong ethnic, you can also learn about the life of the H’mong people and their costumes. If you are a culture enthusiast, then you should visit Ma Tra- Ta Phin. Here, the locals are willing to show you how brocade is made, or invite you to bathe in the herbal leaves of the Red Dao ethnic people or teach you how to make special dishes. 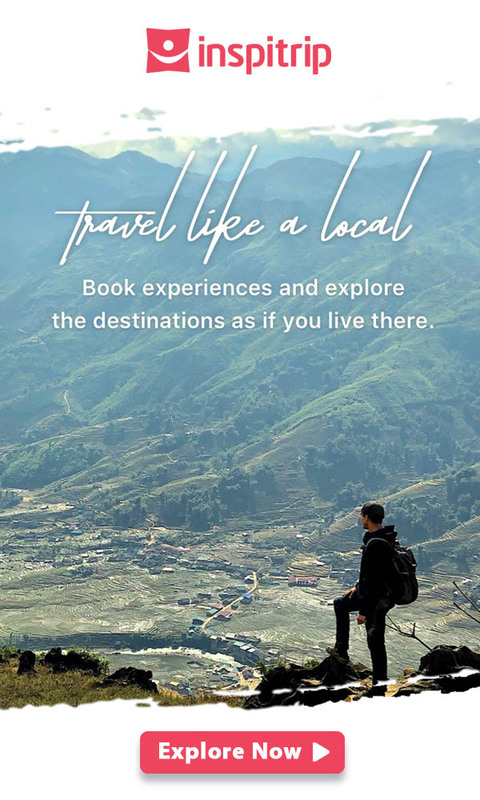 There are many routes that are designed to fit the desire of tourists, and all prioritize to give your the opportunity to experience the culture and lifestyles of the local people. 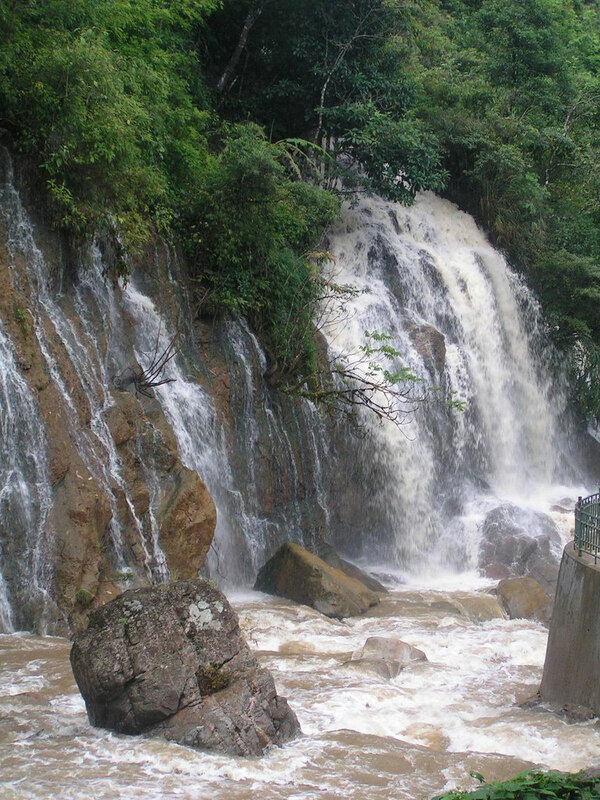 We recommend you should explore breathtaking trekking trails with a local H’mong. Interestingly, the scenery in Sapa changes in accordance with seasonal time, so you should also consider when is the best time to visit Sapa in order to have the most optimal experience. 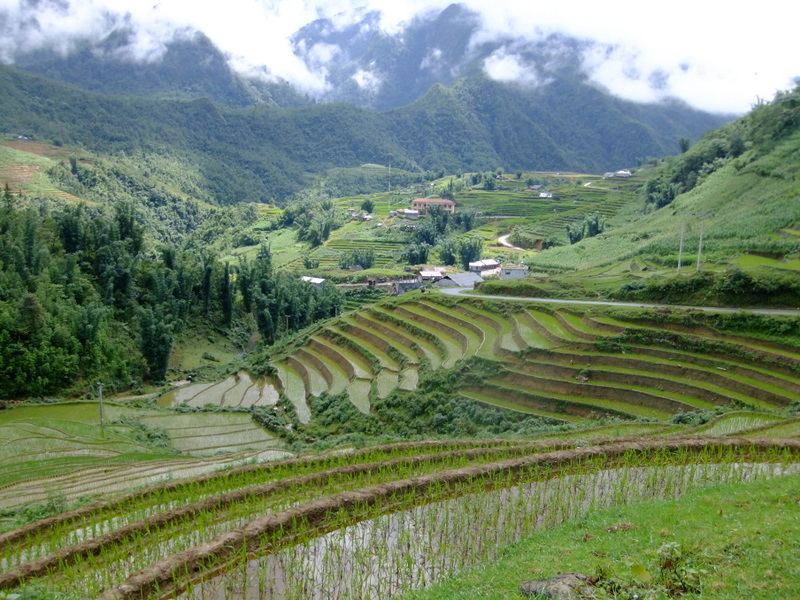 Partake in a trekking adventure in Sapa with Inspitrip now! 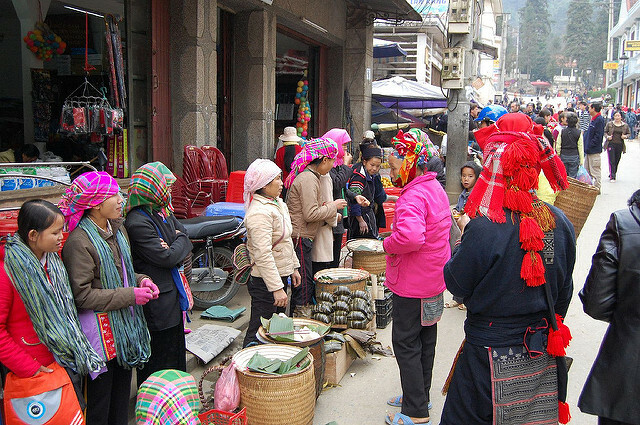 Located in the heart of the town, Sapa market is always crowded and filled with ethnic residents come to trade their products. Being famous for handicraft, their most noticeable and signature work is colorful fabrics and products made out of it, like keychains, scarves, bags, beanies, or even shirts. Souvenirs from Sapa market is definitely more unique and special comparing to plastic ones you can find in big cities. 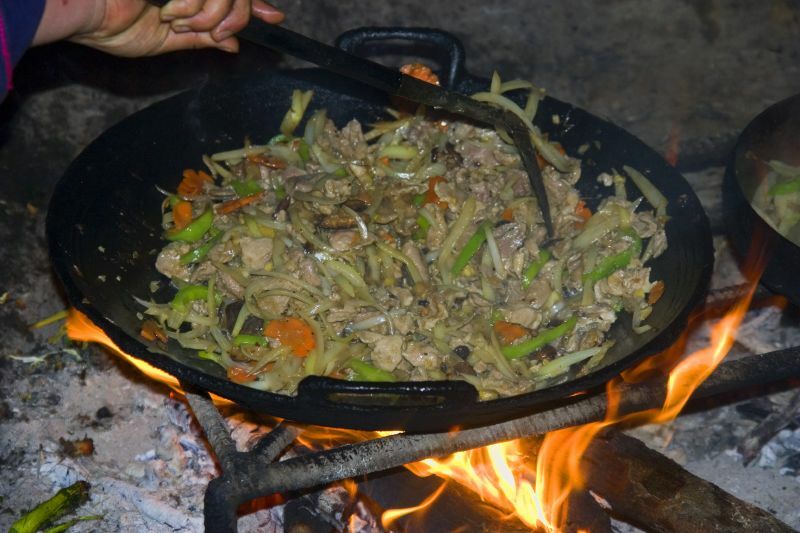 The market also features special food of these ethnic minority groups, which for adventurous travelers, should be worth a try. As the market is in the center area, it is also easy to find travel necessities. Tourists can buy North Face jackets and pants (of course, knockoffs), sports shoes, raincoats or any items that you forget to prepare for the trip. If you are going to trekking, make sure you collect everything you need while being in town before going on the adventure. 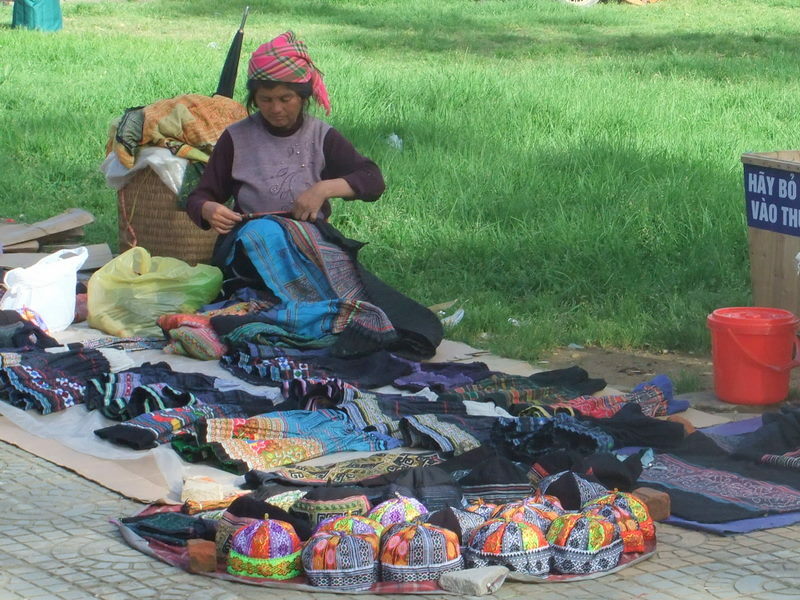 An ethnic minority resident selling her handicraft products on the street. A unique technique in agriculture. Massive rice fields like this are what Sapa so famous for. Visitors can find peaceful, lovely and harmonious nature in the endless green landscape of these rice terraces. The rice terrace in Sapa looks like “stairways to heaven”. This is not a “Thing to do in Sapa”, however, it would be a nice start to your trip. 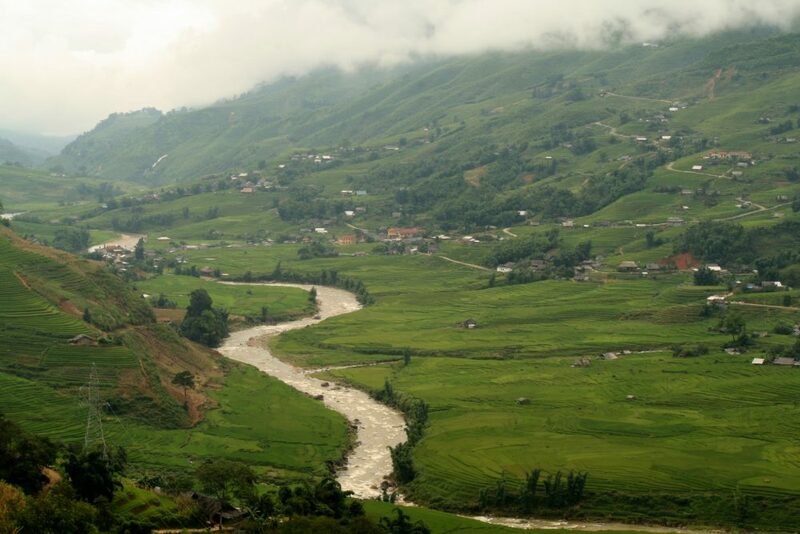 In order to get to Sapa, tourists have to take a train or bus from Hanoi to Lao Cai province. Buses are a faster option (~ 6 hours), while trains take nearly 9 hours. However, most people rate the trains as more fun. The trains always run through the night and tourists will arrive in Lao Cai Province early in the morning. If you are going in a group, take the train and buy enough tickets for a whole cabin. You can prepare food and drinks to spend a night having some bonding time with your friends or family on the train. From Lao Cai Province, you will have to take a 1 hour drive to get to Sapa. Since there is only one train to Sapa per day, hotels will normally have pick-up service for their clients every day. Being considered one of the most impressive natural landscape in Vietnam, Sapa definitely has those waterfalls that would make tourists freeze for seconds. The waterfall looks like a giant silk coverings from a cliff into a stream. On blazing sunny days, the waterfall shoot white foam, vapor water emitted as smog; sun light creates a beautiful rainbow. 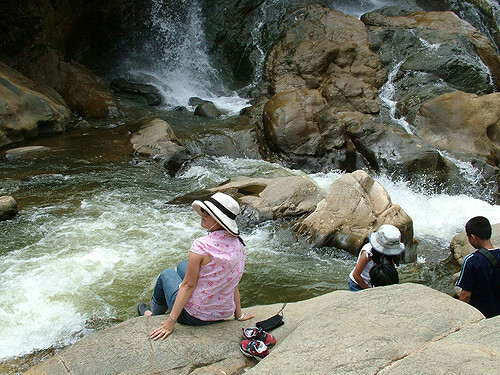 Some areas around the waterfalls in Sapa are safe to take a swim. However, it really depends on the weather as during fall and winter, Sapa is very cold and it is nearly impossible to get soaked in the water outside. As the roof of Indochina, Fansipan is a mountain that all travelers want to conquer atleast once. Normally, the climb takes 2D1N or 3D2N for people who want to take it slow and cannot climb intensively. The climb is not an easy and smooth route, therefore, getting local help is definitely a good choice. Due to the complexity of its topography, it is recommended to sign up for an organized tour from agencies before heading to the mountain. Tourists can find these tours in any hotel in Hanoi, or in Sapa. Agency offices are easy to find in Sapa center as well. The number of tourists that sign up to climb Fansipan mountain is quite small, therefore, tourists can feel safe to wait till arriving in Sapa to book a tour. Sapa homestay is a must-try experience for visitors to this beautiful highland. This is normally included in trekking tours, or tours to visit ethnic minority villages. Staying with locals is an extensively different and unique experience as these people carry a significantly special and distinctive culture. These people live their lives away from the modern world, and maintain their culture separately from the world outside their groups. Despite the huge difference, they are lovely people who offer warm hospitality to visitors. They are normally very enthusiastic about showing tourists their life, home, work, and nature. Food on the make in an H’Mong home for tourists staying over. Besides food, it is also recommended to try coffee in Sapa. Relaxing in a cafe in the romantic, foggy weather while watching all the different people in one small town would be a nice experience and a sweet highlight for your trip in Northern Vietnam. As most ethnic minority people are poor, you will find both adults and children on the road trying to sell something. Even if you are not interested in making a purchase, there is no point in ignoring them. Ethnic people, in general, are very simple, lovely and open. Most of them speak from broken to understandable English, however, considering that they receive no education at all, the fact that they are at a place to communicate in English with foreigners is always a welcome surprise. The key is they would love to be taught by you, tourists from all over the world. So, instead of ignoring them, you can try to communicate, understand these lovely people, and sometimes, they have gifts for you. 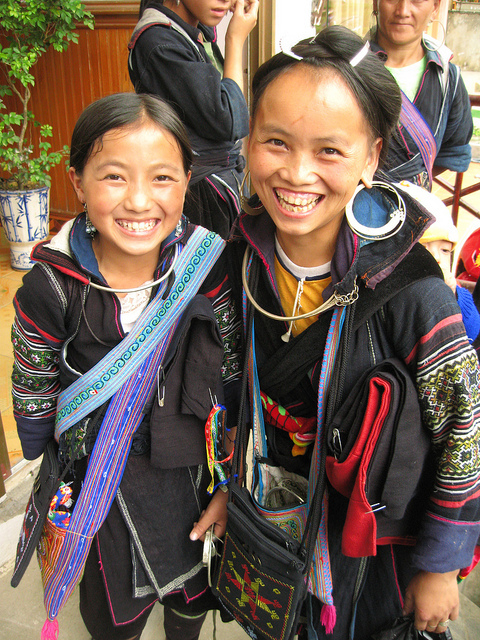 Lovely locals in Sapa with their bright smiles against all natural adversties. The local children are always happy to meet foreigners. Bac Ha Market: Located 70 kilometers from Sapa town. This market is known as the largest and the most colorful market in the Northwest region. Muong Hum Market: Only takes place on Sunday, the market is in Bat Xat District. It is a very busy and exciting market as people from ethnic groups gather here for trading. Wandering around the neighborhood, you will catch a glimpse of locals selling their products on the street. There you have it. Here are the top 10 things to try in Sapa. It is a very unique and special city in Vietnam that would offer its visitors a great and challenging adventure. If you are someone who adores nature and its magnificence, Sapa is certainly where you can satisfy your eyes. If you are someone who adores culture differences and distinctiveness, Sapa will fulfill your mind. Here are a few notes for you before heading towards this beautiful town. Bring your umbrella, or buy a nice raincoat. Pack a thick jacket with you. Bring a good pair of sport/ climbing shoes. Don’t be afraid to bargain. Don’t carry your passport onto trekking trips. (Optional) Do research on tours and your desired activities. It really depends on what you want to try in Sapa to decide whether you need a guide.